Have you ever wondered why Jesus left us the special GIFT of the EUCHARIST? Jesus who knew His apostles through and through in the time spent with them in the last years knew how human they were, as we are. He shared with them that He ardently longed to eat the Passover with them. The arrangements were made. It was the custom upon entering a home to partake in a meal, the daily dust and dirt was washed from their hands and feet. As they gathered, an argument arose among them about who should be reckoned the greatest. Jesus got up from the table, removed His outer garments and taking a towel wrapped it around His waist: He poured water into a basin and began to wash His disciples’ feet and to wipe them with the towel He was wearing. He was showing them that the greater among them is one who serves. They must be people of service as well. LUKE 22: 26 “The greatest among you must behave as if he were the youngest, the leader as if he were the one who serves. For who is the greater the one at table who waits to be served or the one who serves? Here I am among you as one who serves. In their argument about who was the greatest, Jesus saw their humanness. He knew He was leaving them soon and how they needed something TANGIBLE; something they could touch, taste, feel and smell to help remind them He was with them and especially present to fortify them as they journeyed this earth sharing the GOOD NEWS. 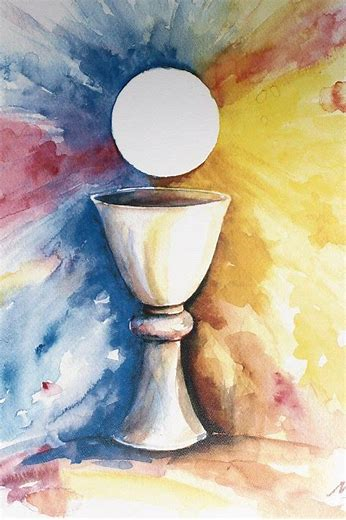 Jesus took what was present — a simple loaf of bread and a chalice of wine and changed it into HIMSELF —-HIS BODY and BLOOD so that they would be FORTIFIED, guided and empowered to inform the world that we have been ransomed by the body and blood of the lamb, JESUS CHRIST. He also, after His Resurrection and His Ascension, sent His HOLY SPIRIT TO FURTHER ENFORCE them. This is also OUR mission. The scriptures remind us of who we are in our humanness and having the privilege of being chosen and being filled with His Holy Spirit through Baptism, Confirmation and with the reception of the BODY and BLOOD of our Redeemer we are also fortified, guided and empowered to share and BE THE GOOD NEWS for our community and our world.